Three important components of a well-run network facility are MPO cables, MPO cassettes, and fiber patch panels. Let’s take a look at how they benefit your network and why they are now considered a necessity for a modern data center. First, we have to understand what MPO is. MPO stands for Multiple Fiber Push-on/Pull-off, an innovative technology used for a multi-fiber application that is required by high-speed data transmission such as a 10G, 40G or 100g network connections. 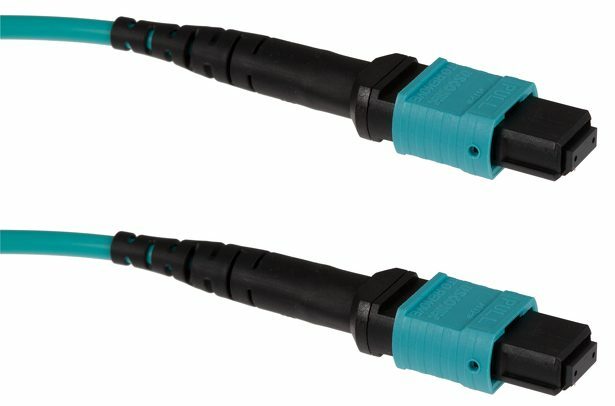 Introduced and brought into use for the first time several years ago, MPO connectors are now widely used all over the world. The technology was developed to lessen the amount of time it takes for splicing individual connectors together. By combining multiple fibers (hence the name Multiple Fiber) in just one connector, it not only reduces the time it takes to connect fibers but also saves an abundance of space. Traditional or legacy fiber cables can make the storage center crammed and quite hard to manage. To get over this challenge, data centers need to deploy ultra-high density network cables to accommodate all of the required cablings. This is where MPO cables come in. MPO cables are composed of fiber optic cables and MPO connectors. The assembly brings together 6 to 72 fibers, with 12-fiber and 24-fiber arrays being the most commonly used. The heart of an MPO cable assembly lies in its connector. It’s available in a female version that has no pins and a male version with pins. These pins make sure that the connector fronts are precisely aligned on contact and that the fibers’ endfaces aren’t offset. The top side of the MPO connector has guide grooves or keys that ensure the adapter holds the connector with the right ends aligned with each other. The push-and-pull design of MPO cable assemblies enables simple insertion and removal which allow for quick and easy installation, reducing installation time by around 75% when being compared to traditional field-termination. MPO cables also allow for higher density connections between network equipment, in turn saving significant rack space. They are also usually modular in design, proven very feasible for future expansion and easier system reconfiguration. Additionally, since installation is very easy, using MPO cables also reduces the overall cost of deployment and maintenance of the network. An MPO cassette is generally a modular module that permits users to get hold of the fibers from a trunk cable and distribute them to a duplex cable. An enclosed unit that houses 8, 12, or 24 fiber factory terminated fan-outs inside. They usually include connectors such as SC, LC, or LT plugged into adapters on the front side of the cassette and an MPO connector plugged into the rear. The interface of today’s most popular 10G optics is the LC connector and at present, the three most widely used cassettes are 8-Fiber to 4xLC duplex cassettes, 12-Fiber to 6xLC cassettes, and 24-Fiber to 24xLC duplex cassettes. Aside from the MPO-LC, there is another type of MPO cassette that is being used today. The MPO-MPO Fiber Cassettes. MPO conversion cassettes house 8, 12, or 24 fibers and have MPO adapters on both the rear and front sides. The most common ones used in the market today are the 2x MPO-24 to 4x MPO-12 and the 3x MPO-8 to 2x MPO-12 MPO. Using MPO cassettes ensures adaptability for the ever-changing data center and network environment. Network administrators face technology refresh frequencies every 12-18 months, and using plug and play MPO cassettes offer a great advantage. When requirements for connectors change in the future, all you have to do is simply swap out the cassettes all while leaving the existing backbone infrastructure intact. A fiber patch panel, which is also called a cross-connect patch panel, can be likened to the nerve center of your cabling network. It offers a brilliantly simple solution for blending manageability, flexibility, and scalability into high-density fiber channels. Simply put, it is where all the infrastructure’s horizontal cabling is consolidated. Fiber patch panels enable the transmitted data to smoothly arrive at its destination. Definitely an indispensable component in today’s network system. Furthermore, a fiber patch panel or enclosure acts as a unit that allows administrators to terminate several cable elements while providing a secure and organized chamber for splice units and connectors. It also helps with limiting wire clutter during setup. With a fiber optic patch panel installed, installations and repairs will be accomplished in a much faster and efficient way. There are currently two versions of a fiber patch panel: the rackmount and the wall mount. Rackmount patch panels are generally made for the standard 19-inch rack mounting. It’s often available with flat or angled design in 1U, 2U, or 4U configurations. The wall mount patch panel has a low profile and compact design, perfect for data centers where space is at a premium. Additionally, it provides clear and intuitive paths for cable routing and can easily be installed on your wall. Using a high-density fiber patch panel comes with many advantages. Along with saving precious space, it also simplifies cable deployment by not needing to run jumpers across the room or under the floor and instead by just simply running a short fiber patch from your network switch up to the panel enclosure. High-density fiber patch panels will give you the highest level of scalability and density. Offering a cost-effective solution and seamless distribution for bandwidth from 10G, 40G, to 100G. CablesAndKits is a fast growing and privately operated network equipment dealer in the United States. We offer a wide selection of MPO cables, MPO cassette module, and fiber patch panels to keep your network running smoothly and efficiently. As experts in awesome, we go above and beyond what’s expected to provide you with a trusted and reliable interaction every time. We have free shipping over $99 plus same-day shipping if you order by 8PM EST. Not only that, but all purchases are covered by a lifetime warranty. We are CablesAndKits. Get more, spend less.